We investigate quantum interference effects in a double-Aharonov-Bohm (AB) interferometer consisting of five quantum dots sandwiched between two metallic electrodes in the case of symmetric dot-electrode couplings by the use of the Green’s function equation of motion method. The analytical expression for the linear conductance at zero temperature is derived to interpret numerical results. A three-peak structure in the linear conductance spectrum may evolve into a double-peak structure, and two Fano dips (zero conductance points) may appear in the quantum system when the energy levels of quantum dots in arms are not aligned with one another. The AB oscillation for the magnetic flux threading the double-AB interferometer is also investigated in this paper. Our results show the period of AB oscillation can be converted from 2π to π by controlling the difference of the magnetic fluxes threading the two quantum rings. Thanks to rapid developments in the fabrication and self-assembly techniques, the electrical transport through nanoscale quantum systems such as a single quantum dot, multiple quantum dots, atoms or molecules coupled to metallic electrodes has been an interesting subject in recent years [1–6]. In the nanoscale quantum systems, the electrical transport is ballistic, while the phase coherence of the electrons is preserved. Especially, the quantum interference effects in an AB ring including a quantum dot have been reported . The results showed that Fano effect with asymmetric parameters was a good probe to quantum interference effects in the nanoscale systems. The transport properties of a quantum ring consisting of two parallel-coupled quantum dots sandwiched between two metallic electrodes have been also studied theoretically and experimentally in the last few decades [7–22]. For example, an AB interferometer including two coupled quantum dots with each quantum dot inserted in each arm was presented, and an oscillating electric current was detected experimentally [8, 9]. Such a double-quantum-dot model consisting of the parallel-coupled double-dot system has been studied extensively in some previous theoretical works [13–18]. When the interdot coupling is considered, a bonding molecular state and an antibonding molecular state are developed. A swap effect can be found in the quantum system by tuning the magnetic flux threading the quantum ring, which may be used in the future quantum computations . Recently, the transport properties of multi-parallel-coupled quantum dots have attracted considerable attention due to their potential applications and abounding physics [23–31]. Zeng et al. studied the AB effects in a quantum ring consisting of four quantum dots sandwiched between two metallic electrodes, and a Fano dip is developed when the energy levels of quantum dots in two arms are mismatched . Guevara et al. offered a quantum model describing multi-parallel-coupled quantum-dot molecule, and Fano effects in the quantum system were studied in detail . More recently, Li et al. studied the electrical transport through a triple-arm AB interferometer consisting of three parallel quantum dots with electron-electron interactions under an applied electric field . 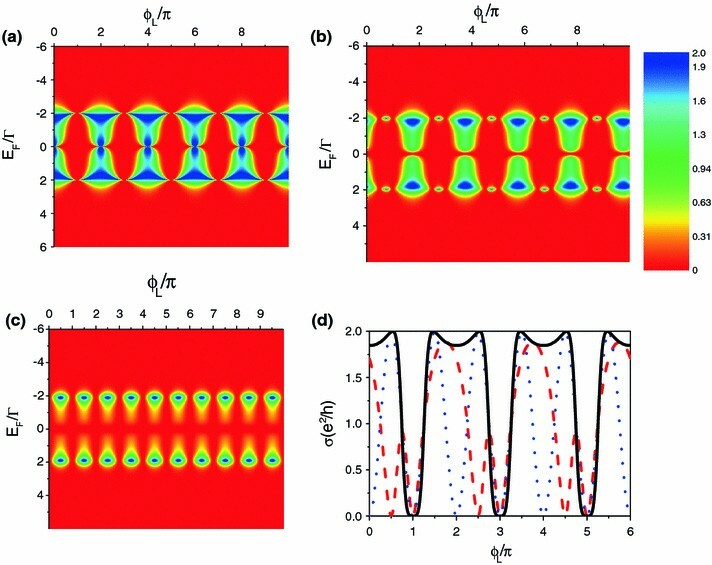 In this work, we study the quantum interference effects in a double-Aharonov-Bohm interferometer consisting of five quantum dots sandwiched between two metallic electrodes as shown in Fig. 1. The left quantum ring consisting of the quantum dot 1, the quantum dot 2, quantum dot 3 and the left metallic electrode encloses the magnetic flux . The right ring consisting of the quantum dot 3, the quantum dot 4, the quantum dot 5, and the right metallic electrode encloses the magnetic flux . Two quantum rings are connected together by the quantum dot 3. For simplicity, we consider that only one energy level exists in each quantum dot, and the energy levels of all quantum dots can be tuned by the voltages applied on the quantum dots. 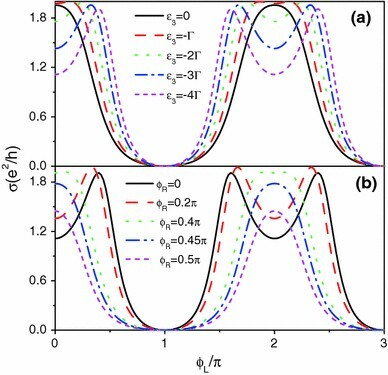 In this work, we studied in detail the quantum interference effects in the double-quantum-ring structure in the case of symmetric dot-electrode couplings. The results show that the linear conductance peaks at zero temperature can be effectively tuned by using the intermediate quantum dot 3. As the energy level of the quantum dot 3 changes, a three-peak structure may evolve into a two-peak structure in the linear conductance spectrum. When the energy levels of quantum dots in arms are not aligned with one another, two Fano dips may appear in the double-quantum-ring device. 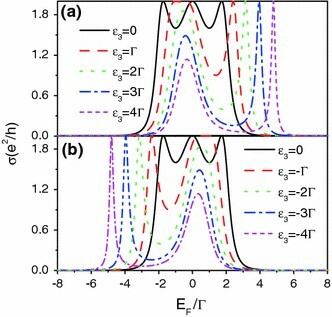 Two Fano peaks can be effectively modified by tuning the energy level of quantum dot 3. The AB oscillation for magnetic flux is also studied in this work. Our results show that the AB oscillating behavior depends strongly on the difference between the magnetic fluxes threading the left and right rings. In addition to the general AB oscillation with 2π-period, an AB oscillation with π-period can be developed when the difference between the two magnetic fluxes is (2n + 1)π(n = 0, 1, 2,…). In this section, the dependence of the linear conductance σ on system parameters is discussed numerically and analytically. The coupling strength between the quantum dots and the metallic electrodes is taken as the energy unit. Through this paper, all energy levels in quantum dots, tunneling couplings and Fermi energy are measured by . We first study the linear transport properties of the double-AB interferometer consisting of five parallel-coupled quantum dots with the same energy levels (ε j = 0, j = 1, 2, 3, 4, 5) in the absence of the magnetic fluxes (ϕ L = ϕ R = 0). Figure 2a shows the linear conductance σ of the double-quantum-ring structure as a function of the Fermi level E F in the case of symmetrical interdot tunneling couplings. The same interdot tunneling coupling strengths are chosen as t 13 = t 23 = t 34 = t 35 = t. There are total five molecular states in center five-dot quantum system, but three molecular states of which with zero energy are degenerate. Other two molecular states are located at −2t and 2t, respectively. So we find that there are three resonance peaks with σ = 2e 2/h appearing at 0, 2t and −2t, respectively. With t increasing, the position of the center conductance peak has no changing, while the other two conductance peaks move in the opposite direction as shown in Fig. 2a. In Fig. 2b and 2c, we display the linear conductance σ as a function of the Fermi energy E F in the case of asymmetrical interdot tunneling couplings. In Fig. 2b, we assume the interdot tunneling coupling strengths as and t 34 = t 35. In this case, three conductance peaks are located at 0, , and , respectively. As t 34 decreases, the conductance peaks are suppressed and become narrower as shown in Fig. 2b. In Fig. 2c, we examine the transport properties of the double-quantum-ring structure by tuning t 23 and t 34. Here we fix the interdot tunneling couplings t 13 and t 35 at . A Fano dip (zero conductance point) appears at E F = 0 when t 23 (t 34) is different from t 13(t 35). 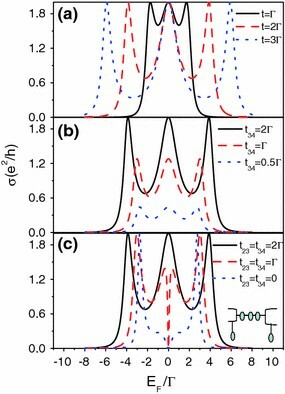 The behind reason is the destructive interference effects between the electron waves directly transmitting through the three coupled quantum dots in series and side-coupled quantum dots (see the inset in Fig. 2c). As t 23 and t 34 decrease, a three-peak structure in the linear conductance spectrum evolves into the four-peak structure. When t 23 = t 34 = 0, the quantum device becomes a three quantum-dot array sandwiched between two metallic electrodes with side-coupled quantum dots as shown in the inset of Fig. 2c. 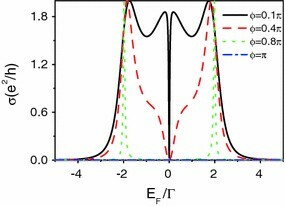 The Fano dip is located at the energy levels of the side-coupled quantum dots (ε2 = ε4 = 0). It is noted that two peaks become closer and narrower as t 23 and t 34 decrease. When t 23 = t 34 = 0, the two conductance peaks are located at . Figure 3 displays the linear conductance σ as a function of E F when the energy level of the third quantum dot ε3 is not aligned with those of the other four quantum dots. Five molecular states appear at , respectively. When ε3 = 0, three conductance peaks with σ = 2e 2/h are centered at 0, and , respectively. The linear conductance σ as a function of E F under the different values of ε3 is plotted in Fig. 3a and 3b. The left two conductance peaks evolve into a single conductance peak, and the right conductance peak moves in the right direction in the case of ε3 > 0. We also find the height of the left conductance peak is suppressed. In the case of ε3 < 0, the situation is in inverse. The right two conductance peaks evolve into a single conductance peak, and the height of the conductance peak is suppressed. The left conductance peak moves in the left direction, and the height of the conductance peak has no changing. In order to explore the dependence of the linear conductance on the energy level of the intermediate quantum dot 3, we plot the linear conductance as a function of ε3 under several different interdot couplings in Fig. 4. With ε3 increasing, the linear conductance first increases and reaches the maximum value at the certain value ε3m . When the interdot couplings become small, ε3m moves toward the Fermi energy. Once the interdot couplings are enough small, the resonant conductance peak is almost pined at E F . The transport properties of the double-quantum ring are similar with these of a single quantum dot coupled straightly to metallic electrodes. From the above equation, we see clearly σ = 0 for or . The linear conductance spectrum has mirror symmetry around ε3 in the case of ε3 = 0. With increasing ε3, the mirror symmetry is broken. The left Fano peak is suppressed, while the right Fano peak is firstly suppressed, then it is enhanced. where δ1 and δ2 represent two small quantities. Equation (26) shows two narrower conductance peaks are centered at as shown in Fig. 6. When ϕ = n π(n is odd number), the linear conductance disappears everywhere for any value of E F .
So an AB oscillation with π-period is developed as shown in Fig. 7c and 7d. It is well known that an oscillating current in the AB interferometer has been detected experimentally [8, 9]. 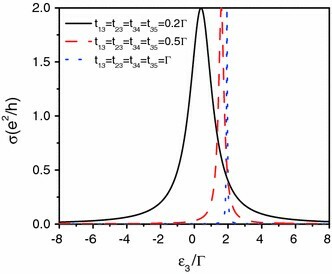 For a single quantum ring consisting of two parallel-coupled quantum dots sandwiched between two metallic electrodes, 2π-periodic oscillation of the linear conductance σ is reported in the pervious works . The linear conductance σ as a function of ϕ L under the different energy levels in the quantum dot 3 or several different values of ϕ R is shown in Fig. 8. The Fermi energy E F is fixed at , and other system parameters are chosen as in Fig. 6. The AB oscillation for ϕ L in the presence of different energy levels of the quantum dot 3 is potted in Fig. 8a. For ε3 = 0, a series of shaper resonant peaks appear at 2n π(n = 0, 1, 2…), and the linear conductance reaches a minimum (σ = 0) when ϕ L approaches (2n + 1) π(n = 0, 1, 2…). 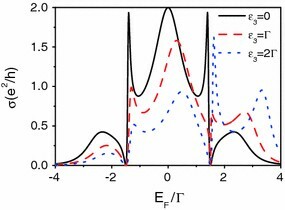 When the energy level in quantum dot 3 is not aligned with other quantum-dot levels, the single conductance peak around 2n π splits into the two conductance peaks. With ε3 moving away from zero energy point, two conductance peaks move in the opposite direction. It is noted that the double-peak structure around 2n π disappears slowly as the magnetic flux threading the right quantum ring increases. In summary, the transport properties and quantum interference effects in a double-AB interferometer in series consisting of five quantum dots in the case of symmetric dot-electrode tunneling couplings are studied by using Green’s function equation of motion method. The energy levels of all quantum dots can be tuned by the voltages applied on the quantum dots in experiments. The linear conductance can be effectively modified by the intermediate quantum dot 3. As the energy level in the quantum dot 3 changes, a three-peak structure in the linear conductance spectrum evolves into a two-peak structure. When the quantum-dot levels in arms are not aligned with one another, two Fano resonances with different Fano factors may appear in the quantum device. The AB oscillation for the magnetic flux in the double-AB interferometer is also studied in this work. The results show that the AB oscillating behavior depends strongly on the difference between the magnetic fluxes threading the left and right quantum rings. An AB oscillation with π-period for the magnetic flux threading the left quantum ring is developed when the difference between the two magnetic fluxes is (2n + 1)π(n = 0, 1, 2,…). The authors thank the supports of the National Natural Science Foundation of China (NSFC) under Grant No. 10947130 and the Science Foundation of the Education Committee of Jiangsu Province under Grant No. 09KJB140001. The authors also thank the supports of the Foundations of Changshu Institute of Technology.